Welcome to PRASM: Happy New Year from the PRASM Team!!! It's a new year and PRASM is still a brand new label! The excitement is still so fresh and new for all the possibilities we see in the near future of PRASM. Let's begin with why PRASM is so focused on color. Color isn't just an expression for the world of fashion, but even more it's an expression of yourself -inner and outer. Colors are important because they carry frequencies or energies that serve a great purpose in enhancing your life. Many of us don't realize the power behind colors and as a result we wear colors and don't open our minds to the possibilities of what each color can bring. For instance, if you wear the color white -and you hone in on the energies that color gives off- then you find that you're drawing in or projecting a sense of purity, openness, simplicity, balance and harmony. Your mind has to be open and aware of what each color means in order to tap into its benefits. If you are AWARE that the color beige can bring neutrality, calmness, nurturing, gentleness and fluid emotion to your life, then you can reap the known benefits of wearing it! Hope that makes sense to our readers... If not, leave us a comment or two and we can have an exchange. We encourage our readers to get involved with us. We'd love to receive some feedback! When considering the fashion side of things, color can be the essential thing to take your attire to the next level. This can mean that you're rocking the color red, but would like to throw it off with accents of a purple belt and a pair of green socks. This is great because you not only spruce up your look, but you also draw in the positive energies of at least 3 different colors. In another sense, you can utilize our fabulous and color-oriented PRASM accessories to take a neutrally-colored outfit to the next level with great accents! So lets say you've decided to go for a casual look today -jeans and a t-shirt. 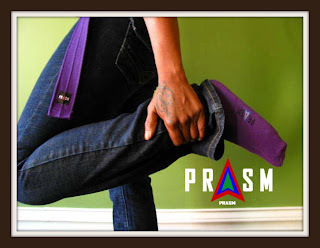 You can spice it up with a high-quality, green, canvas PRASM belt and a pair of thick, comfortable PRASM socks to match. In this way, you make your outfit speak for you without your having to spend much time in your closet or mirror! Isn't that a nice way to be fashionable without trying hard?! At PRASM, our goal is to reach those from every walk of life who have a natural flair for making a personal statement or for those who simply want to add a sense of value to what they wear and how they wear it! For those who realize the importance color, PRASM is a great line to go with! Why PRASM? PRASM wins out over most brands because it is the first of its kind to focus solely on color and the significance of it. It inspires a variation in your style without your having to spend a lot of money or time in the process. Try the PRASM label for yourself and introduce your family and friends to us! They'll fall in love with a new and different way to express themselves. Not ready to check out PRASM for yourself yet? No problem! In the meantime, simply check the full collection of our color-style canvas belts and thick, color-style socks at www.PRASMClothing.com! And don't forget to leave us comments here. We'd love to get your thoughts on the new color-style revolution at PRASM! Cheers and have a wonderful rest of the week! !